A Belgian painter, engraver, draftsman and designer, George Lemmen, was born in 1865 in Schaerbeek. For a short period he studied at the school of drawing in St. Josse-ten-Noode. In the early 1880s he became influenced by Degas and Toulouse-Lautrec. 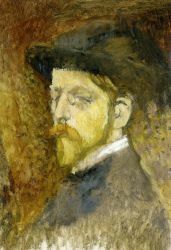 In 1888 he joined the avant-garde group Les Vingt in Brussels. 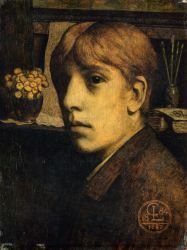 In 1890-1893, under the influence of Théo van Rysselberghe, he moved towards Neo-Impressionism and painted numerous landscapes and portraits using the technique. He exhibited at the Salon des Indépendants in Paris and participated in Les Vingt exhibitions in Brussels. The death of Seurat in 1891 had a great impact on all the painters of the Neo-Impressionist group. By 1895 Lemmen freed himself from Pointillism and painted in a more traditional, Impressionist style, though his colors were closer to those of the Nabis-painters. During his travel to England Lemmen became interested in artifacts. His one-man show in 1913 in Brussels had a great success. In July 1915 he moved to Ukkel, where he died in July 1916. His wide-ranging work includes numerous book illustrations, posters, ceramics, carpets, drawings, pastels and gouaches.